An egg in a bottle may not be very interesting, although the science behind how the egg got into the bottle in the first place is. This is in my opinion an interesting experiment that shows the effects of atmospheric pressure and partial vacuums. The atmospheric pressure of the kilometres and kilometres of air molecules pushing down on us is unnoticed by us because the pressure inside us pushes out with equal force. In this experiment we decrease the pressure in the bottle so that it is no longer equal to outside air pressure. We reduce the pressure inside of the bottle by creating a partial vacuum. The surrounding air is then at a higher pressure than the air in the bottle and the egg is pushed into the bottle. To create the vacuum simply drop a burning piece of paper into the glass bottle this will heat up the air in the bottle causing the molecules to spread out due to their increase in kinetic energy (movement energy) and some of the air molecules move out of the bottle. 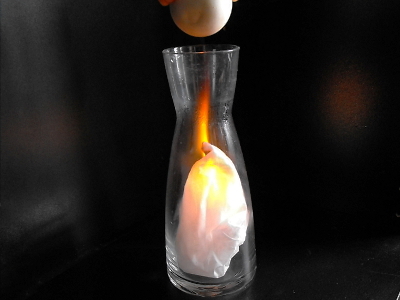 Then the egg is put into the neck of the bottle and then the fire will go out due to a lack of oxygen. Once the air cools down again in the bottle the molecules will bunch (essential, in reality the number of molecules and the energy that they have is not enough to maintain the original pressure and so the pressure in the bottle will drop) up because they no longer have enough energy to stay as far apart and this causes a partial vacuum. If the difference is great enough you will have an egg in a bottle. A bottle with a neck that is just smaller than the egg. seal around the neck of the bottle so that air cannot flow into the bottle allowing the partial vacuum to be created. Now light the piece of paper (get an adult to help you with this step if one is required) let the burning piece of paper drop into the bottle. Then place the egg in the neck of the bottle and wait for it to get pushed into the bottle by the surrounding air which is at a higher pressure compared to the pressure inside the bottle. Now that you have an egg in a bottle your probably wondering how to get the egg out of the bottle. It is also possible to get the egg out of the bottle using the same principles. Only this time you have to raise the pressure inside the bottle as to push the egg out instead of in. This can be done by blowing into the bottle whilst the egg is sitting in the opening of the bottle. Then when you stop blowing the egg falls into place covering the opening of the bottle and the high pressure in the bottle forces the egg out of the bottle. If this fails just take a knife and cut the egg apart inside the bottle so it will fit through the opening. Go back from 'Egg in a bottle' to home.